4 July 2005 - The Codex Alimentarius Commission has voted to adopt potentially restrictive guidelines for vitamin and mineral supplements proposed by the Codex Nutrition Committee. In its 28th session here in sun dried, heat plagued Rome, the planet's supreme food regulator has given a nod to industry in approving guidelines for food supplements over the strenuous opposition of consumer representatives. Several associations representing consumers and health practitioners were present under the banners of the National Health Federation: Friends of Freedom from Canada, the Europe-based Alliance for Natural Health, Danish MayDay, La Leva from Italy, the US Health Freedom Coalition as well as the Dr. Rath Health Foundation. The question is really, whether freedom of choice in healthcare will be respected. Although the guidelines are not in themselves restricting supplement sales, they do prohibit information about diseases and nutrition and they call for future dosage restrictions to be set after scientific evaluation of the safety of nutrients contained in pills and capsules. Consumer representatives who attended the meeting are concerned that the guidelines, in conjunction with the European Union's directive on food supplements, may be a first step towards heavy controls on nutrition that would favor the pharmaceutical approach to disease over active, consumer-driven prevention. After dealing with previously submitted comments by Australia, Brazil, China and Venezuela, the vitamin and mineral supplements guideline was passed by a passive vote - no objections from a full 85-member-assembly - one item on a lengthy list of standards and guidelines to be adopted. Here is the text of the Codex Vitamin and Mineral Food Supplements Guidelines as approved by the Codex Alimentarius Commission. "What now?" was the question of those concerned health freedom advocates who attended the meeting, one of whom answered: "We may have lost a battle, but the war is far from over". Indeed, much now depends on the discussions recently initiated by FAO and WHO, to work out a proper model to assess the risks inherent in supplements. "But rather than only assessing the risks, they must look at the immense benefits from these nutrients as well as the risks, before they can reach a proper decision", commented another one of the activists. Agreement is building that risk assessment procedures developed for toxic chemicals cannot be applied to nutrients without making a dog's breakfast. So where do we go from here? We must continue working to make sure that the benefits of supplements are not overlooked when deciding whether to limit quantities or composition of supplements, but this also ties in to a much larger issue: Are corporations going to decide how we should take care of our health or will people be free to choose? There is a tough time ahead. Perhaps what is needed is a real change in health care, a reform that would sweep pharma-dominated medicine, which in the US has become the major cause of death and injury, off its pedestal of exclusive 'guardian of health' to allow all kinds of alternatives to fluorish so people may have a meaningful range of choice when it comes to health and well being. 1. The guidelines do not state what purpose they serve, although that is required by Codex rules adopted as recently as a year ago, but well before the November 2004 Nutrition Committee meeting that finalized the text. 2. There is no clear definition as to what vitamins and minerals are covered by these guidelines. Although supplements "should contain vitamins, provitamins and minerals recognized by FAO and WHO", according to the text, there is actually no publication of the FAO or WHO that provides lists of recognized vitamins, provitamins and minerals. 3. Certain countries are exempted from the application of the guidelines. Those countries that consider vitamins and other nutrients should be regulated as drugs are exempted. This means harmonization of different national laws, the goal of all Codex activity, is not being forwarded by the guidelines. I might add that, while the guidelines ask for restrictions on supplements in the comparatively liberal countries, the really backwards view of "nutrition is really medicine and any of those nutritional supplements are drugs" is acknowledged as being quite acceptable. Indeed, one of the amendments to the guidelines was Australia's demand to emphasize that "These Guidelines apply only in those jurisdictions where products ... are regulated as foods". November 2005 saw the 27th meeting of the Codex Committee on Nutrition and Foods for Special Dietary Uses take place in Bonn, Germany. The Committee, one of 27 currently active Codex committees, has been meeting in Germany since its inception in 1966, and was responsible for the drafting of the controversial Guidelines for Vitamin and Mineral Food Supplements. However, and as this article will show, the most potentially damaging aspects of the Committee's attacks on natural healthcare and health freedom are still to come. Thanks to The American Policy Center and NewsWithViews.com our article with the provocative title, "Kiss Your Vitamins Goodbye", flooded the internet in the last two weeks of June leading up to the Codex Alimentarius meeting in Rome July 4-9, 2005. Millions of readers were on the edge of their seats waiting to learn what was about to happen. This article is a report on that meeting. Joint commission of the Food and Agriculture Organisation (FAO) and the World Health Organisation (WHO), Codex Alimentarius Commission (CAC), has moved to enforce higher global food standards. Among the measures adopted were guidelines on vitamin and mineral food supplements and a code of practice to minimise and contain anti-microbial resistance. Could Vitamins Be Outlawed in America? There is growing concern among many of the manufacturers of vitamins supplements and their consumers in the United States that severe restrictions could be placed on the products they make and buy for their health if a group called Codex Alimentarius gets their way. There are two distinct approaches to vitamins, both with nuances. One approach sees the main purpose of supplements as preventing diseases caused by deficiencies, like scurvy, beriberi and pellagra. The early quasi-official "recommended daily allowances," which have been revised only slightly, are based loosely, without allowance for individual biochemical or environmental differences, on the amounts of nutrients needed to prevent deficiencies that lead to deadly diseases. Other researchers, including Linus Pauling (who developed the concept of "molecular disease" after DNA was discovered), Denham Harman (the free-radical theory of aging) and Roger Williams (biochemical and nutritional individuality) began to develop and test the idea that there might be levels of nutrients that not only prevented deadly diseases but improved health and ameliorated the aging process. Since the late 1950s studies have suggested strongly that the intake of certain vitamins can reduce the risk of numerous diseases, including heart disease and cancer. From The vitamin police by Alan Bock, Sr. editorial writer at The Orange County Register on Lew Rockwell's site. CODEX: WHAT IS IT AND HOW DOES IT AFFECT YOU AND YOUR HEALTH? Codex is not just about nutritional supplements. In fact, it is the primary political battlefield where the war is being waged about who will regulate and control the global food supply from farm to fork. This 'war' is being waged by an increasingly tangled web of global authorities, big business and financial interests, and, as such, trade and profit are its prime goals � not human health. A legal challenge to overturn the EU's controversial Food Supplements Directive is over, but the corporate takeover of herbal medicine and natural remedies continues, writes Sam Burcher of the Institute for Science in Society. Jim Turner, the general counsel to The Weston A. Price Foundation, a charity that disseminates knowledge on nutrition, believes that Codex and the EU Directive on food supplements derive from the same basic reductionist model of western science that argues that pharmaceuticals are the only answer to health problems. World food experts refute this model by stating that natural vitamin A supplements can offer developing countries thirty times as much social improvement as one dollar of development aid. Turner recommends that vitamin and mineral guidelines should be evaluated by nutritional science rather than the toxicological science used to evaluate toxins. Codex categorically states that nutrients should be treated as toxins and that foods and nutrients are not useful in treating disease and therefore supplements are of little value. JULY 5, 2005. As many of you now know, yesterday Codex officially certified its own plan to limit the sales of nutritional supplements. 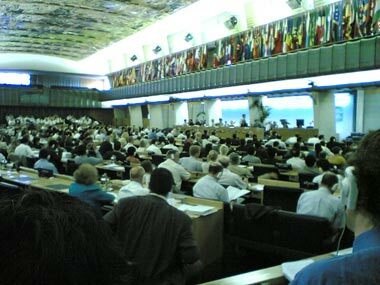 Codex's Rome conference had been scheduled to begin on the 4th for some time. The coincidence is too great to be an accident. This was a piece of ritual. "On the anniversary of your independence, we take a giant step toward curtailing your freedom." America is the most formidable target for Codex, and Codex did not miss the opportunity to make its move on the 4th. Codex and so-called free trade are, of course, linked. One of the faces of free trade is "harmonization" of national laws under a larger umbrella. That umbrella is being built by men who are devoted to a future in which all national distinctions and sovereignties are erased. As I've written in these pages for four years, health and the choices surrounding it are in the cross-hairs of the globalists for a very good reason: if natural health and the means to achieve it are chopped down, what will be left are universally dispensed toxic drugs, illness, and the resulting weakness which will induce widespread passivity. A passive population can be managed with greater ease toward ANY political goal. A passive population can be manipulated and fooled and herded into ANY future. Codex is an arm of that globalism which has a very specific political goal and future in mind. In brief, it is the rule of the many by the few, behind the cover story of: "we are doing all this because we care about you and we want to protect you and help you and save you from the ruinous conflicts of the past." You will, of course, notice that much of that language is also used by medical tyrants who seek to impose their pharmaceutical model on the planet. It is war by other means. When at least 100,000 people in the US alone die every year from the prescription of FDA-approved medical drugs, when 2 million people each year in the US are hospitalized as a result of those drugs, and when 22 million serious adverse reactions to those drugs occur in the US every year, you can begin to perceive the outlines of this chemical war. The single greatest resistant force to this chemical onslaught is natural health and all the strategies that compose it. Subject: Shine some virtual truth onto the codex cockroaches. The major problem and mistake isn't how to combat Codex on a tactical manner by trying to fight in hearings, codex meetings, etc. because those avenues are already controlled by Codex adherents. They own the game, the rules, the players, the umpires, they already own it all and have programmed exactly how it will unfold. So how much chance do you think that we will have trying to win in a rigged game like that? They are really winning because they are doing it in the dark. Most people in the world have never heard of Codex and if they have, they have only heard about the sanitized propaganda version put out by the codex misinformation campaign. The only way to win this thing is what should have been done in the first place and that is to bring the truth to the peoples of the world. You need to send that truth to all of the web page owners that you can think of because it obviously is never going to be published in the major media. It does not matter if they are vitamin oriented or not. Some of those owners are going to be vitamin takers and they personally will be affected. We may not be organized but we could put millions of guerilla fighters out there spreading truth. That is the real weapon here. They fight with lies, subterfuge, and keeping the truth hidden. We must fight with truth as our weapon. It will win. You need to post many times a day on every internet group that you belong to the real situation and tell everyone that they are losing the basic right to even take vitamins. Don't be shy. This is some of the BIGGEST NEWS to hit the planet. The thing that has been lacking in this fight is that the people leading this fight keeps playing into the hands of the enemy by only concentrating on playing the rigged game that is controlled by their enemies. The real decision will be played out in the court of world opinion by the populations of each country affected, but that fight has been lost so far because those people aren't even aware of what is going on and what they are about to lose. The reason that these Codex people have been winning all along is because they are doing it on the sly and keeping most everyone in the dark about what underhanded efforts are underway. They want to keep us focused on the rigged game. They are like cockroaches that come out under cover of darkness shielded from the light of truth. What we need to do is shine that light of truth on them. Not debate them, not play their game, but attack with the truth. Shine the light on these bastards and let everyone see them for the vermin that they are. Some of that vermin will be politicians in your own countries. You will need to shine that light on them as well. I don't care what laws have already been passed or what they do about them. Tell them that you are no longer going to play in a crooked game that you had no chance of winning anyway. Attack the bastards day by day, every day, in the only media that was ever available to the people anyway. Attack them all over the web. Attack them a hundred times a day if at all possible. Attack them in Japanese, attack them in French, attack them in whatever languages that you can communicate in. Send the info to all of your friends that speak a different language and ask them to traslate your letter of information and then ask your friend to join the fight too. To those web page makers and to those graphic designers out there make many banners, photos, etc. and post them on public spots so that others can use them to put on random web pages, etc. If you can write, then write something and post it around and make it available so others who have difficulty writing can use it to post all over. You are really fighting for your lives, the lives of your families, the lives of the future members of your family. Yes, your ranks are small, but they will grow fast if the light of truth is spread to the world. Take a few people in hand that do not know how to fight and become a band of 2, 3, 4, or 10 guerilla fighters in your band. The message is simple and dramatic. You are losing the right to take any vitamins. It must be said over and over and over till everyone in the world is saying it too. If you are not willing to do that then set down, shut up and prepare to get in line for your Prozac, Vioxx, etc, and any other police state things that are bound to come along afterwards. Don't tell other vitamin people about it and feel that you have "done your part" Hell that is what that has been going on all along. You have to take your fight to the averge people in the streets. The streets of the internet. Every block, every house, every chat room, every bulletin board, every group, every web site, every online publication, every god damned place on the web. You need to shine the light of truth on the cockroaches that are undermining your life and undermining the health of the world. Now get off your butts and go do something, Anything. Don't you belong to a few groups? Start there. Do you know any web page owners? If you don't it doesn't make any difference. Start there too. You don't need to know them. All you need to know is that they need to know. Write them a letter that you have prepared explaining what is going on. Send it to them and keep revising and editing your letter till it sounds great. Keep posting it to other web page owners. Keep posting it to any and all forms of media on the web. Post it to the Indy media outlets. Post it to the people motivating groups like Move on and others. Post it on every Mom and Pop web page in the world. Take a piece of virtual chalk and write it on the sidewalks and buildings of the virtual world. You are in a fight for your lives right now, so is it going to be you or them? Now, get of your butts and do it. Don't forget to look at the film 'We become silent' linked from the left part of my website. It is very important to know what the initial objectives of Codex Alimentarius were back in 1963: How to equally spread NUTRITIONS throughout the world. It had nothing to do with medicalizing the foodsupplements that they are now trying. We are interesting on the future information. I feel like I want to run and hide from this country (USA) I was born here and i feel as though my life is threatened and i will be soon taken prisoner for refusing pharmacueticals. I don't want to live here anymore, it's becoming a prison. These articles are brought to you strictly for educational and informational purposes. Be sure to consult your health practitioner of choice before utilizing any of the information to cure or mitigate disease. Any copyrighted material cited is used strictly in a non commercial way and in accordance with the "fair use" doctrine. 'Bird Flu', SARS - Biowarfare or a Pandemic of Propaganda? Did Aspartame kill Cory Terry? Retroviral particles in human immune defenses - is AIDS orthodoxy dead wrong?